The literature in all forms should understand the life of all sections of people – especially the Dalits, indigenous people, rural people, marginalized people, women et al in totality giving voice to their problems, and their potentials, said Vice Chancellor of Tripura University Dr V L Dharurkar. 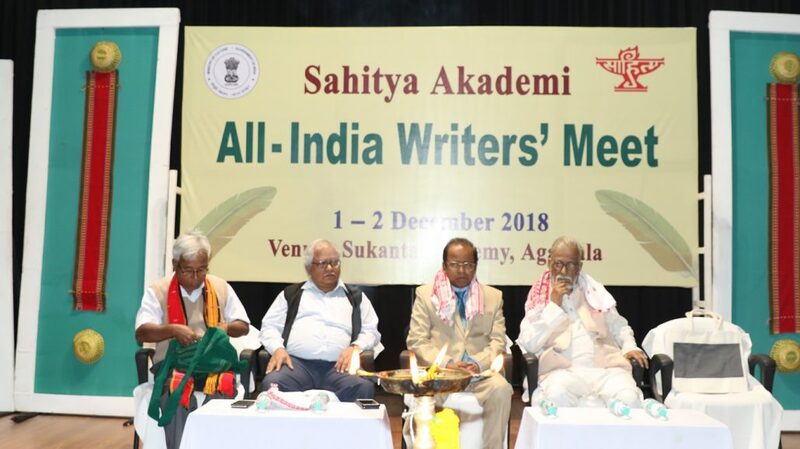 “Understanding the ethno-cultural process of the nation is the main key to solve the problems and conflicts of various shades that beset us”, said Dr Dharurkar who presided over the inaugural programme of the Sahitya Akademi sponsored two-day All India Writers’ Meet at Sukanta Academy auditorium on Saturday. In his speech, Dr Dharurkar maintained that the Indian literature required to be more enriching, more wide, more interesting and more encompassing to manifest the life and aspiration of a cross-section of the people from nook and corner of the country- right from Dalits, downtrodden, women to all. With detailed references to the cave arts and frescos, icons and murals across India that were handed down to us from the ancient time, Dr Dharurkar who had done extensive research on them said, to understand even the great cave arts the oral literature of the regions had provided him the missing links and complete the studies. “Even the eminent international experts maintained in clear terms that in India the whole process of creative upheaval or for that matter any creative revolution led to the process of ‘Indianism’. In fact, he said, right from Vedic literature to Dalit literature the process is still afoot. This was the purpose in the past, this still is the purpose at present. He dwelt extensively on the present trend and status of the Indian literary movements with references from various authors, poets, and intellectuals working in the field. While the Vice Chancellor pointed out that the literary activities of the country was facing a paradigm shift – stories and novels and drama getting smaller, he also stressed on the need of finding out true dimension and purpose – ‘Indianization’- of literary or for that matter any creative activities. The Vice Chancellor also informed the gathering that in Tripura University, teachers had already translated some folk songs in Hindi. “Our Kokborok department is very active in producing various books, novels drama,” he said and added that Tripura University was establishing a cluster of literary studies on Bengali English, Sanskrit. He also invited the literary figures from across the country who participated in the meet to visit Tripura University and give lectures to the students. In the meet, Prof Saroj Choudhury stressed on such meets for meaningful and effective interactions of writers and authors of various languages. Only then the unity and diversity of the great nation could be understood and experienced, felt Prof Choudhury. Nirmal Kanti Bhattacharjee, who gave the keynote address, in his speech discussed in details present statuses of literary activities across the country. The welcome address was given by Sahitya Akademi secretary K Sreenivasa Rao while the vote of thanks was given by Director of North East Centre for Oral Literature Chandrakanta Mura Singh. As many 24 writers and literary activists from across the country from various languages are participating in the two days meeting.